Harvey at IMAO noticed that the national debt hasn't changed for several months. He suggests that the Most Transparent Government Evah, run by the Smertest President Evah, has simply stopped doing math. With all due respect, I suggest that Harvey is missing all the nuances of this Genius of Geniuses. It's not an abandonment of math. It's a whole new math. 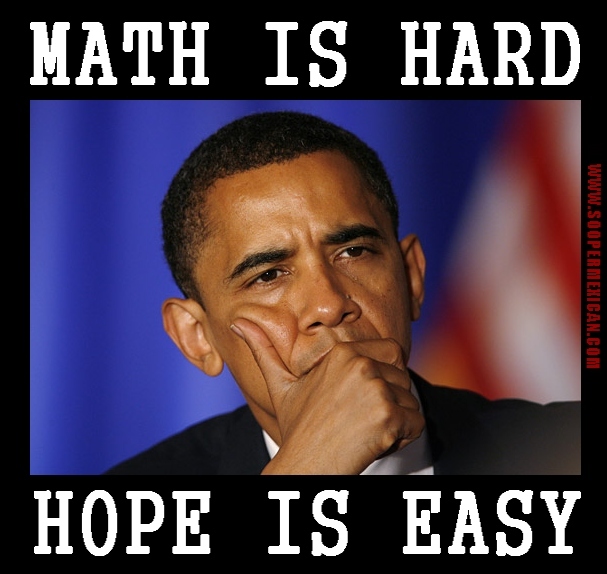 It's the magical math that is ObamaMath. As Harvey noted, you take a total deficit of $16,699,396,000,000. Next, you increase that by $97,594,000,000. What is the new total deficit? I best you said $16,796,990,000,000. But, guess what? You'd be wrong. It's $16,699,396,000,000. How is that possible? ObamaMath! That's the same way you can have health insurance costs go up, but still be paying less. Sure, you bank account looks smaller, your take-home pay looks smaller. But that's because you don't apply ObamaMath. A smaller bank balance is actually a raise in pay. And you can thank Obama for that. Well, Obama and his wonderful, magical ObamaMath. Gas gone up to nearly twice what it was when Obama took office? Well, not really. It's actually less. That's because $1.869 ÷ 2 = $3.539. ObamaMath! And, here's a secret that many people don't know: you too can use ObamaMath. Walk into a grocery store, fill your shopping cart with food, give the clerk a dollar, and walk out. It'll be okay. Just explain it's ObamaMath. Bank send you a credit card bill? Send them a corrected statement back, showing a $0 balance. Explain it's ObamaMath. 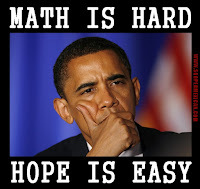 There is no end to what you can accomplish with ObamaMath. Does Obama keep doing daylight savings time to the debt clock? We are still running a deficit of about a trillion this year, like every year, yet the clock will probably not change. Something is fishy here. And they used to accuse George H.W. Bush of "voodoo economics." @2 You can't accuse a Kenyan of voodoo economics because it is racist. I don't even think you can accuse him of Keynesian economics because it sounds too close to Kenyan and that would be racist. Basil, I think ObamaMath only works top down to explain how great things are. I don't think that the "little folk" are allowed to use it in their pathetic everyday lives. I'm worried about the "ObamaAfterMath."